Bedding Information: 1 King. 1 Queen & Twin Bunk Beds. This dramatic custom home, located 10 miles south of Sunriver, was designed and built by a doctor as his dream retirement retreat. The east-facing wall toward Mt. Newberry and the Little Deschutes River is all windows - 16 feet high and 60 feet across! - giving you exceptional views and lots of wonderful light inside the home. The home features two large bedroom suites with vaulted ceilings, each having its own full bathroom. 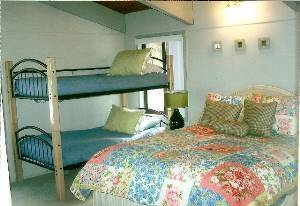 One bedroom has a King bed and the other has a Queen and Twin Bunks. It is ideal for couples or a family with children. The secluded setting makes the home very popular for honeymoons. There are no adjoining homes to spoil the feeling of peaceful privacy in the home or when you are in the hot tub on the view deck. A great variety of wildlife - deer, otter, beaver, eagles, hawks, quail, and jumping trout can often be viewed from the home (field glasses provided). Inside, the home has been furnished for maximum enjoyment, with such items as large-screen TV's, more than 100 movies, a glassfront wood stove, and a massaging leather recliner in the living room. 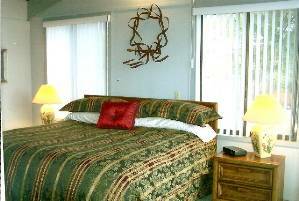 Both bedrooms have TV's and goosedown comforters on thick pillowtop mattresses. The open-design kitchen features a Jenn-Aire range and large workstation island, plus a great assortment of utensils and spices. A separate game room has a tournament-quality pool table, foosball table, arcade games, exercise equipment, and a real slot machine (takes provided tokens). There are also many hardcover novels and music CD's provided for your enjoyment. And just two steps out the back door is that big hot tub on the view deck. One of the greatest pleasures in the world is slipping into that warm water on a clear night and looking up at the millions of stars that can be seen here at our higher altitude. This part of Oregon is in the "rain shadow" of the Cascades, with 300 days of sunshine a year and a very comfortable cool dry climate during the summer months. Golf and other outdoor activities can be enjoyed in non-sweaty comfort. Nearby are several world-class golf courses, Mt. Bachelor (used by Olympic ski teams for training), countless pristine mountain lakes, wilderness hiking/biking trails, volcanic attractions, and scenic drives. There are so many things to do here - no boredom! We also provide free rubber rafts and tubes - you can put in at various places upriver and float back down to the dock in our back yard. On a warm summer day, this is great relaxing fun for both adults and kids. 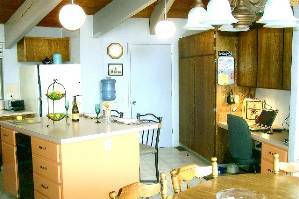 It is an easy 10-minute drive to either Sunriver Resort or to the town of La Pine for groceries. 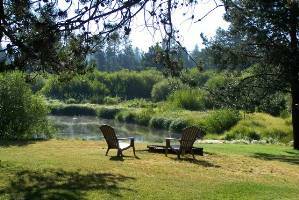 Bend with its many fine restaurants and major shopping malls is only 20 minutes away. We understand many people want to include the "other members of the family" in their vacations, so pets are welcome - there is a large dog run and the property is doggy heaven. The wooded property begs to be explored, the river makes for great swimming, and there are fat squirrels in need of exercise. We just ask that pets be kept off the furniture and that you pick up after them outside. You may now pay with a credit card through the secure PayPal service. Game room with pool table, slot machine (takes tokens), dishwasher, daily newspaper, pillowtop mattresses and goosedown comforters, massaging recliner, over 100 movies, books, music CD's, river rafts provided during summer, large dog run. 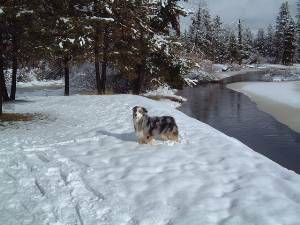 Wilderness hiking and biking trails, guided fishing trips, mountain and rock climbing, tubing, sled runs, snowmobile rentals, caves and volcanic attractions. 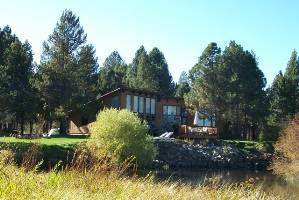 The home is right on the bank of the Little Deschutes, with a wall of windows facing the river and mountain view. Reading,watching fish jump in the river or napping. 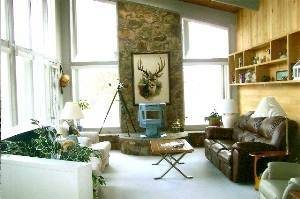 Spacious front room with grand view of Paulina Peak. Master bedroom with full bath. Second bedroom with queen, bunks and full bathroom. Full kitchen with all amenities. Summer floating on Little Deschutes. Perfect place for relaxation and fun recreation! We have stayed here three times with our family and it is our favorite spot. We floated every day and enjoyed the expansive green lawn to lounge upon and read. Mornings on the deck, watching the swallows feed their babies, drinking coffee and watching the visiting deer was just what we needed to unwind. Thank you again Nick, for a wonderful visit!! Happy New Year, thanks for sharing your home. Played in the snow everday, enjoyed the hot tubeach nite. The wildlife greeted us each morning. Loved it ! It was so relaxing, just awesome ! Thanks for sharing your home with us. You made us feel so welcome. We will be back. Enjoyed the all the wildlife, peacefulness of the setting and the local activities. A Geat getaway ! Thank you so much for letting us stay in you beautiful home. You've taken so much care and thought in what you have here. It is delightfully stocked with the "things" we need and couldn't appreciate it more. We floated the river, fished, played horse shoes, pool and just sat outside with the animals. Thanks for the thoughtfulness. Kayaked the Klamath Marsh Wildlife Refuge and picknicked along the Crater Lake Rim. The whole family enjoyed the Little Deschutes and the wildlife within reach. Slept great, ate healthy ! Enjoyed family time. The Best . The Most Peaceful place we've been ! OCTOBER THROUGH MAY, EVERY THIRD NIGHT IS FREE! (Offer not available for major holidays or spring break.) Pay for 2, stay 3; pay for 4, stay 6, etc. Deposit: One night's rent deposit (non-refundable) due at time of reservation. Balance of payment is due at least 30 days in advance of arrival. Cancellations and Refunds: Refund for short-notice cancellations or date changes if reserved nights are re-rented, less deposit. Other Fees: $200 refundable damage deposit - can be paid with separate check that will be returned uncashed if no damage or extraordinary cleaning required. Required Stay: 2-5 days, depending on season.